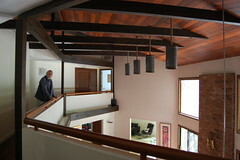 I still haven't got over my obsession with wood as the major design element at The Cool House. 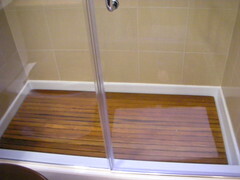 The teak shower bases we put in the downstairs bath and the boys' bath have been very successful; they are warmer than tile, and much less slippery. I'd really like to get more wood into the master bath remodel and have been mulling over the idea of paneling the master bath walls in walnut. I love the concept but I don't want it to look like a 70s sauna, so I'm focusing on wooden sinks and baths that might give me more of the look I want without the feeling I should be beating myself with birch twigs. 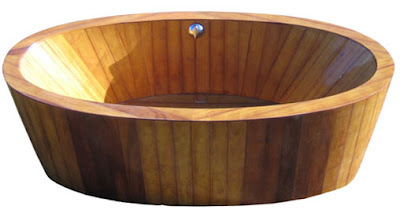 Bath in Wood of Maine handcraft a double tub from inch thick mahogany planks. Laguna Basic wood tub in walnut. 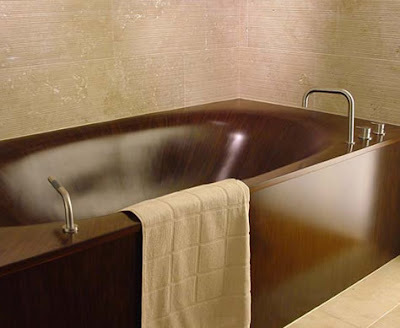 The Leguna Basic tub is probably my favorite, the one that fits best with overall style of the house and it's small enough to replace the existing tub without any major changes to the plumbing or layout of the room. What about you? Any particular tub strike you as swoon-worthy? Laguna, definitely. Gorgeous! I hadn't heard of these before either! Very cool indeed. Beautiful images. Very modern design. That tub is amazing. Rather than paneling, maybe you could do some ceiling beams? I just dicovered your blog through Hooked on Fridays -- it looks great!! 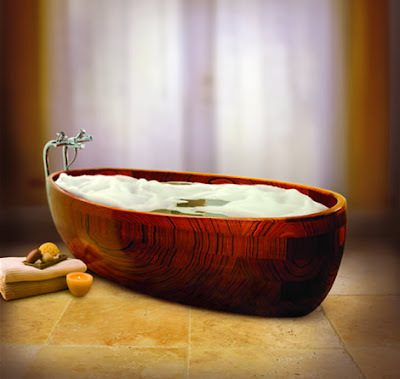 The wood tubs are GORGEOUS!! The last one is my favourite. The wood looks SO sleek and smooth... I think it would feel awesome taking a bubble bath in that one!! Who know? I certainly didn't. I had no idea ---a wooden tub? The Laguna is stunning to look at. Thanks everyone for dropping by. 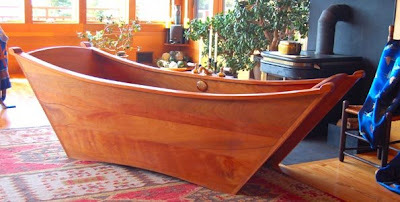 I guess I've always had a love of wooden boats and these bathtubs remind me of tugs bobbing in the water. Come back and visit when ever you have a chance. That tub is fabulous. Thanks!